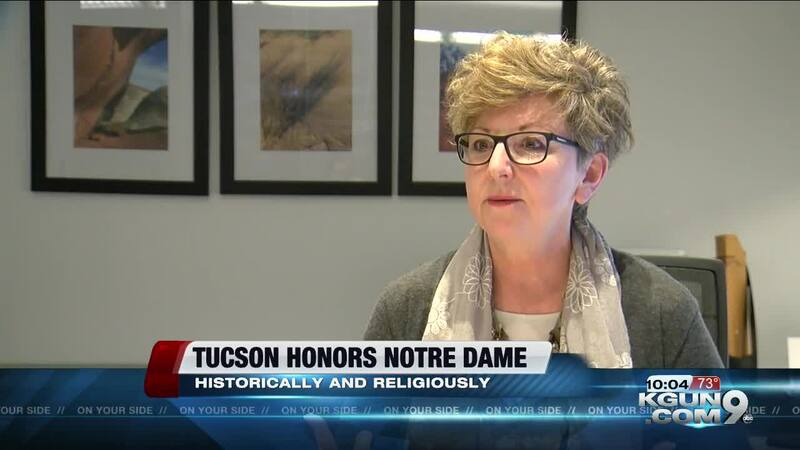 The fire at Notre Dame Monday left a lasting impact on the Tucson community, especially within the Catholic community. Saint Augustine Cathedral Bishop Edward Weisenburger said, it's more than just a building to their community. "Churches for us in the Catholic world are not just a place where something sacred happens, the space it's self becomes sacred for us," Bishop Weisenburger said. Notre Dame is a true encompass of that, he said. "Every time I walked in that incredible cathedral, I just intuited a tremendous sense of the sacrate there," Bishop Weisenburger said. He said it had been over 30 years since he was inside the building, but he still remembers it like it was yesterday. The cathedral was built over 850 years ago, taking about 100 years to build. "It was created to create awe in people and that's exactly what you see when people visit that cathedral," Dean of the College of Architecture, Planning and Landscape Architecture Nancy Pollock-Ellwand said. She said the architectures wanted people to think about heaven when they entered the building. "Your eyes are drawn up because of the whole structure," Pollock-Ellwand said. "The intention of the builders was to feel like you're moving towards heaven." This wasn't just made for people of religion, but everyone who walks through the doors. "These historic places, these historic monuments, there ones that mean an awful lot to, not only the people of France, but we (everyone) have so many examples of this kind of heritage that it's universal in it's appeal and heritage that is so important to our identity," Pollock-Ellwand said. "It's so important to our ascetic and appreciation to our humanity. I think that this really under scores history and heritage to us (everyone)." For the Catholic community, that identity, and their church, is more than just a building. "It is a tremendous loss for us, but at the same time, I know the faith and the good people of Paris and France will rebound wonderfully," Bishop Weisenburger said. To read more about the tragedy in Notre Dame, click here .